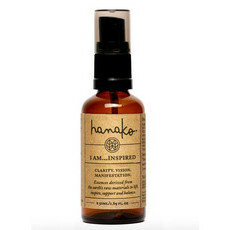 The Hanako Therapies I Am...Faith has been carefully crafted from a blend of eleven pure essential oils, gem and flower essences and crystal-infused, purified water to create a rich, woody, sweet, harmonious floral scent that cleanses negative energies, supports in times of stress, lifts the mood and builds self-esteem. Containing Bergamot, Patchouli, Ylang Ylang and Palmarosa to combat negative emotions, relieve stress and encourage optimism; Sweet Orange to uplift and encourage positive emotions; and Rose, Black Pepper and Ginger to help warm the emotions, and energise the body and mind, this scent is an ideal natural alternative to synthetic perfumes. Hand made In Australia, with 100% pure essential oils and gem infused waters. Vegan. No Animal Testing. Bergamot, Rose, Sweet Orange, Ylang Ylang. Pure essential oils of Bergamot, Patchouli, Rose, Sweet Orange, Black Pepper, Ylang Ylang, Palmarosa, Ginger. Gem and flower essences, crystal-infused water, mantra and love. Spray liberally over the crown of your head and all over your body while repeating the affirmation: "I now release any fears that are holding me back. I am beautiful and divine and deserving of all good." I spray this on after a shower, had many compliments and love the smell. My favourite Hanako - mountain cabin kind of scent going on. Used around the house and on my body as a scent.